Tell us why you’re madly in love with your library. Fill out a postcard while at your branch, download this sign or share a photo on FOLMC’s Facebook, Twitter, and Instagram pages (be sure to tag #ILoveMyLibrary). Celebrate the theme All Roads Lead to the Library featuring music by Alex and the Kaleidoscope. Appropriate for elementary-school-aged children. Sponsored in partnership with the Montgomery County Library Board and Friends of the Library, Gaithersburg Chapter. Celebrate Library Lovers Month with stacks for the stacks at the Original Pancake House (OPH). OPH will generously donate 15% of sales to FOLMC. When you shop at our bookstores in February, round up your purchase to the nearest dollar, and donate the change to FOLMC. Proceeds benefit Montgomery County Public Libraries (MCPL). Photos from the 2018 LLM Kickoff. Every year Library Lovers Month is celebrated in our county during the month of February. FOLMC and the Montgomery County Library Board present an annual family-friendly kickoff celebration, where the County Executive and council members join us to recognize the value of libraries in our community. Throughout the month of February, FOL chapters and branches host Library Lovers Month themed programs and activities. 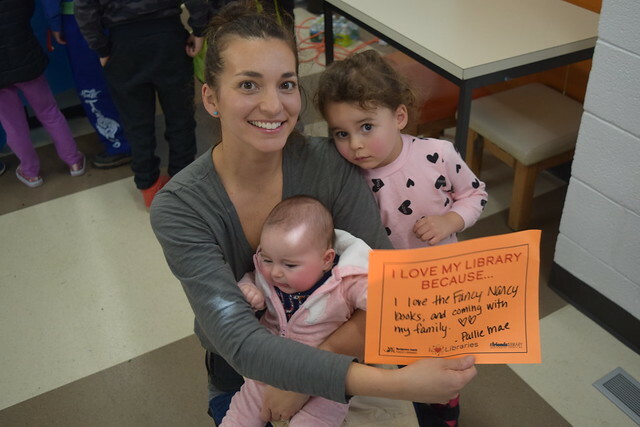 Patrons are encouraged to fill out postcards telling us why you love your library. We share these postcards with your local representatives during advocacy season to remind them why our libraries are essential to our community.